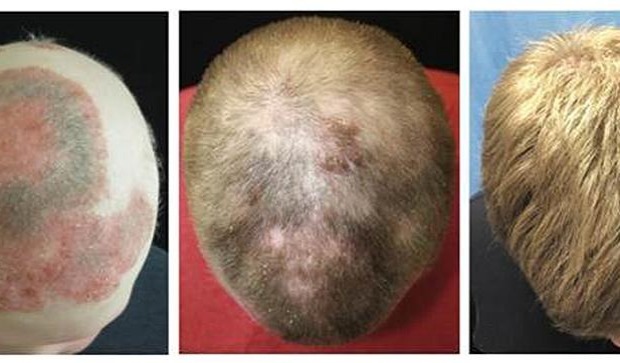 Since images of hair-loss reversal appeared in the international media some twelve days ago, Brett King has been receiving 200 to 300 emails a day from people seeking help with hair restoration. There have been several threads on this already. The result: absolutely no signs of interest or action from the MPB research community so far. We already saw this sort of thing happening with the similar cancer drug several years ago. I guess MPB researchers still aren’t very interested in finding a solution coming from a direction they aren’t already specialized & invested in. Well, the thing is that the kind of hair loss we have is different from the kind of hair loss that the patient who got cured has. They are different kinds of hair loss and they will require different kinds of treatments. The AGA researchers know this and this is why they are not interested in this latest story. The AGA researchers are right to ignore this type of information and not waste precious AGA research dollars on it. Another drug in this same class has been known to put a big hairy patch of dense terminals onto the middle of a shiny NW#6’s vertex. And a patch of terminals onto the nose of another patient, where there could never have originally even been any scalp-type terminal follicles beforehand. But since this recent patient was AA instead of MPB, there must not be anything worth learning from these drugs about treating MPB. Gotcha. Terribly written article by an uninformed journalist. She repeatedly used the term “alopecia” instead of “alopecia universalis” to describe the patient’s condition. ALOPECIA just means hair loss, period, full stop. Anyone who has any kind of hair loss has alopecia by definition. Alopecia does not refer to the type or cause of hair loss. People with MPB have androgenetic alopecia. Others have alopecia universalis, alopecia totalis, alopecia areata, etc. But just because they’re all called “alopecia”, doesn’t mean they all have the same or similar underlying cause. I’ll get into that much more in another post soon.